The existing Interfaith playground had been deemed unsafe, out of compliance, and was off-limits as recreation space until improvements were made. According to Foundation Chairman Robert P. Lamprey, the MutualOne grant allowed the purchase of a set of swings for the children’s enjoyment at the new playground. The $5,000 grant to support the new Hoops & Homework playground was among awards totaling $61,840 in the Foundation’s most recent round of funding. Established in 1998 as the philanthropic arm of MutualOne Bank, the MutualOne Charitable Foundation has since donated over $4.1 million to charitable, educational, and civic initiatives that improve and enrich the quality of life in Framingham, Natick, and surrounding communities. 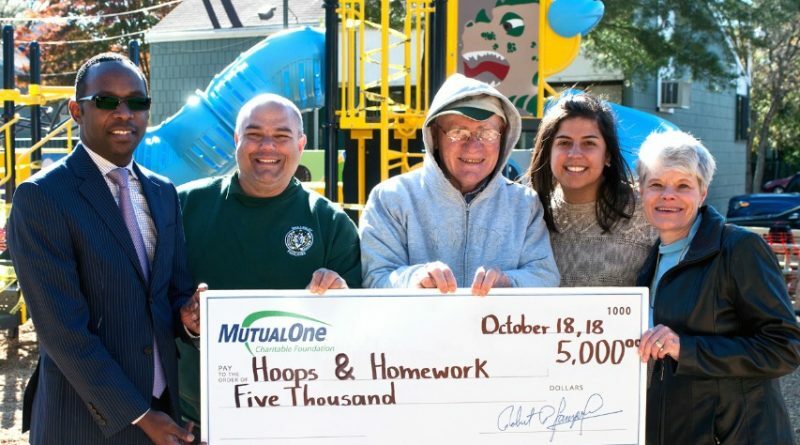 Celebrating the MutualOne Foundation’s grant to Hoops & Homework to support the community playground on Interfaith Terrace are (from left): Yves Munyankindi, MutualOne Bank retail support and foundation administrator; Ricky Finlay, Hoops & Homework volunteer; Herb Chasan, founder of Hoops & Homework; Priscila Sousa, Hoops & Homework board member; and Cheryl Tully Stoll, Framingham Councilor-at-large.